When it comes to retirement finances, Americans have two top concerns: reliable, adequate retirement income that will not run out and the ability to move retirement plans from job to job. A new report from the National Institute on Retirement Security (NIRS) finds that public defined benefit (DB) pension plans stack up well on both counts. 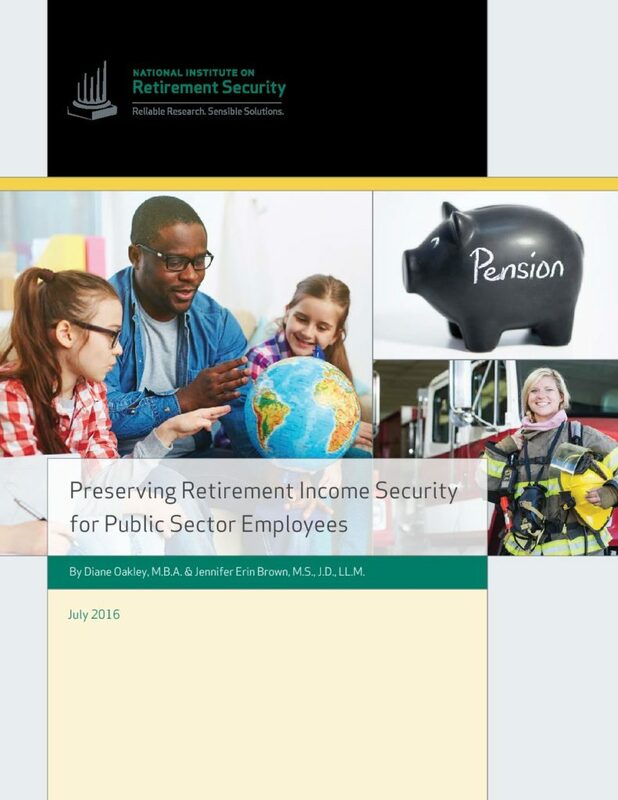 Preserving Retirement Income for Public Sector Employees finds that almost all public retirement systems offer DB pensions that provide a modest, but stable retirement income that lasts through retirement. The research also finds that nearly all state retirement systems have features that allow for preservation of retirement income benefits even for employees who change jobs via the purchase of service credits, interest credits on withdrawn contributions and re-depositing of employee contributions. Many public pension plans have adopted features that allow individuals who change jobs to retain and even increase their benefits. Employee contributions can follow employees to new employers, often at market or better interest rates. Most plans allow members to later rejoin a system and repay any refunds with interest. Nearly all public DB systems allow members to purchase additional service credits to increase their pension benefits in retirement. Specifically, all public DB plans allow for the purchase of service credits for prior military service, and more than half of the plans surveyed allow for the purchase of credits for prior out-of-state government service. Some plans allow for the purchase of credits for other specified types of service and leave. A number of plans have features that increase benefits for short or moderate-term employees. Modifications include increasing the value of the deferred annuity benefits paid to former employees, rewarding employees who choose to keep their member accounts in the plan with interest, and providing even higher matching amounts. These features can encourage workers who leave before retirement to preserve the lifetime retirement income benefits they have earned, rather than spend their refund. The study results are based on a survey of 89 public pension plans to determine plan types, employee contribution rates, vesting requirements, interest rates paid on withdrawn employee contributions, refunds of member accounts, re-deposits of employee contributions and ability to purchase service credits. All survey results for the 89 public pension systems are published in the Appendices to the report. For systems that did not reply to the survey, data was obtained from the Public Plan database, National Association of State Retirement Administrators reports, and public pension plan web sites.